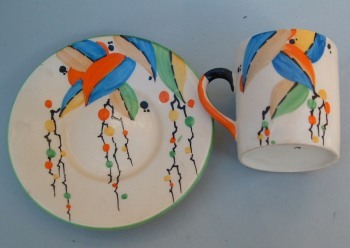 these ceramic cup and saucer were made between1920 and 1935 by B.P. 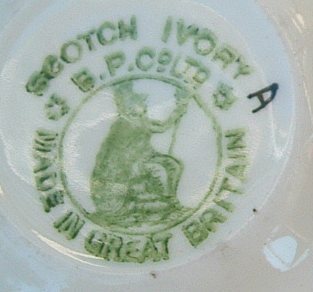 Co. Ltd, under the mark Scotch Ivory. 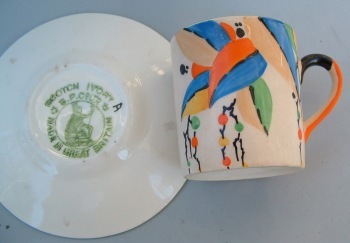 From 1920 to 1935 Cochram and Fleming used Britannia mark and the production of the firm was known as Britannia Pottery. The cup is 2 1/4 in. high (cm. 5,5) and the saucer is 4 in. wide (cm. 10) and were bought from an Italian dealer at an Antique Fair.